This is it: Summer, great weather, the Olympics, and #MetaBeers returning shortly. This month we’ll be in another new location, the Crown Tavern on Clerkenwell Green. 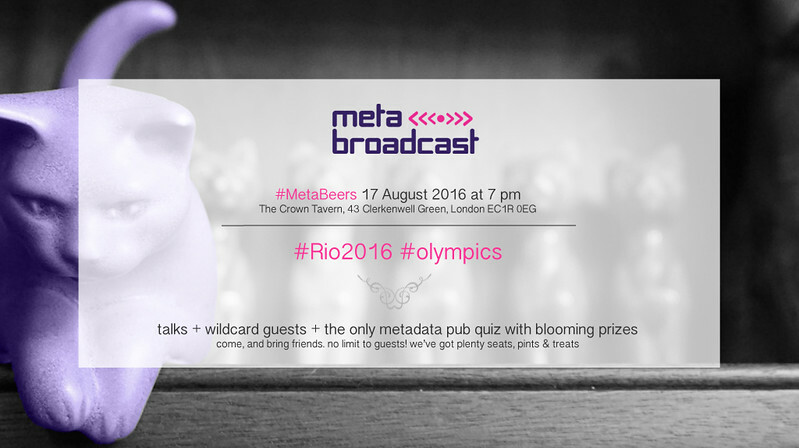 In July we talked about live events, then we had the only metadata pub quiz with floral prizes, some seriously spicy mexi-cali food, and drinks including many pints of ice cold pilsner, poured from our own tap. Just what the doctor ordered on a day where the thermometer barely dipped below 30 degrees. The next date for your diary (as advertised in our newsletter) is Wednesday 16 August from 6:30pm for a 7pm start. We’ll be talking about the Olympics, and what we can learn from them for other event TV. Join us! martins — why the olympics aren’t for me? next time: what about september? In September we’ll talk about the immersive power of TV shows that feel like movies. Mad Men, Sherlock and True Detective come to mind. Looking further into the future, in October, as winter approaches, we’ll discuss what makes the perfect TV series. But that’s still a way away. For now, please do join us on Wednesday, August 17th. Updated: a few times 15-17 AUgust, to add to the schedule.